Place sliced strawberries and peaches in a medium sized cast iron skillet. Spread the fruit slices out so that they cover the bottom of the skillet and are layered evenly. In a mixing bowl, combine oats, slivered almonds, almond flour, shredded coconut, coconut sugar, cinnamon, and salt. Once they are stirred together, add in the coconut oil and mix until all the ingredents are coated. 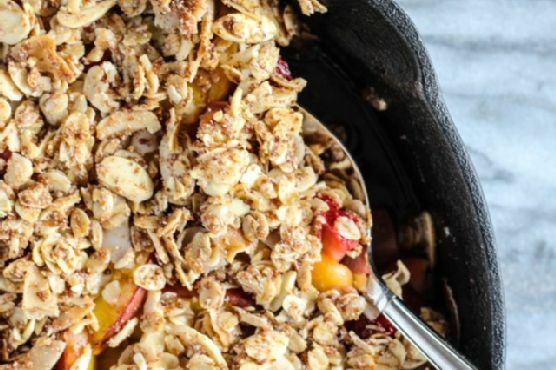 Top the strawberries and peaches with the coconut oat crumble. I used my fingers so that every part of the skillet gets an even amount. Bake for 35-40 minutes, or until fruit is juicy and the crumble is golden. Top with whipped cream or vanilla ice cream, dairy free if needed.